CUSAT M.Tech Counselling 2017- कोचीन विज्ञान और प्रौद्योगिकी विश्वविद्यालय काउंसिलिंग is going to be conducted by Cochin University of Science and Technology from last week of May to first week of June 2017 for admission into M.Tech courses. CUSAT M.Tech Admission is going to be done on the basis of valid GATE Score secured by the candidate. However the candidates who have not appeared for GATE will be alloted seat on the basis of their performance in the departmental exams which will be conducted after CUSAT Counselling 2017. The University conducts the counselling process completely on merit basis, therefore Cochin University M.Tech Counselling Procedure includes a number of steps such as CUSAT M.Tech Counselling Dates, registration, choice filling, document verification, seat allotment etc. To get more details, you can go through this article and check below the details of Counselling. Cochin University of Science and Technology offers admissions into PG engineering admissions courses on the basis of candidates’ score in GATE. Eligible candidates must attend the CUSAT CAT Counselling which is going to be conducted from last week of May to first week of June 2017. However vacant seat will be filled by non-GATE candidates on the basis of their performance in DAT which will be conducted by University. Cochin University of Science and Technology has declared CUSAT Counselling schedule for CUSAT M.Tech admissions. 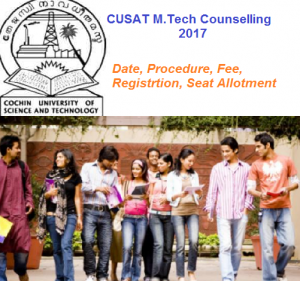 Check below the details of important dates of CUSAT M.Tech 2017. Eligible applicants applying for Cochin University M.Tech Admission must appear for CUSAT M.tech Counselling Process which includes a subsequent number of steps. Get the details below. In this process, candidatess must login first by entering their user name and password for registration and at the same time mention their “Keralite” or “Non-Keralite” status. Once it is done, they can enter as many options as required for courses and colleges/departments.However the choices of colleges can be edited till the last date. Any kind of call letters will not be issued to candidates and therefore applicants must check the schedule and attend counselling procedure for document verification, fee payment, and all the further process. The CUSAT M.Tech Seat Allotment will be done on the basis of merit list and it will be announced for the candidates who have successfully registered and applied for Cochin University Counselling. Candidates who are allotted their respective seats must register themselves for CUSAT CAT Counselling 2017 at the venue, i.e. seminar complex (in front of the administrative office, S.Kalamasserry, Kochi-22), by the alloted time. Candidates after completing their document verification are required to collect their fee challan. Fee must be paid at the SBT counter either via Cash/Demand DraftCredit/Debit Card/ RTGS funds transfer facility. The CUSAT M.tech Admission will be done on merit basis. Therefore eligible candidates must go through CUSAT CAT Allotment process and get their desired seat. Applicants will be called for CUSAT counselling process and provided their respective seats on the merit basis. With the Process of CUSAT M.tech Admission candidates can get admission into Engineering PG programs in Cochin University of Science and Technology. Therefore we have provided here details of CUSAT Counselling 2017, through which interested applicants can get their required information along with the details of Top Engineering Colleges. Keep visiting our portal and grab the latest information.